← Hanging Pictures on a Staircase, Creating a Gallery Wall. 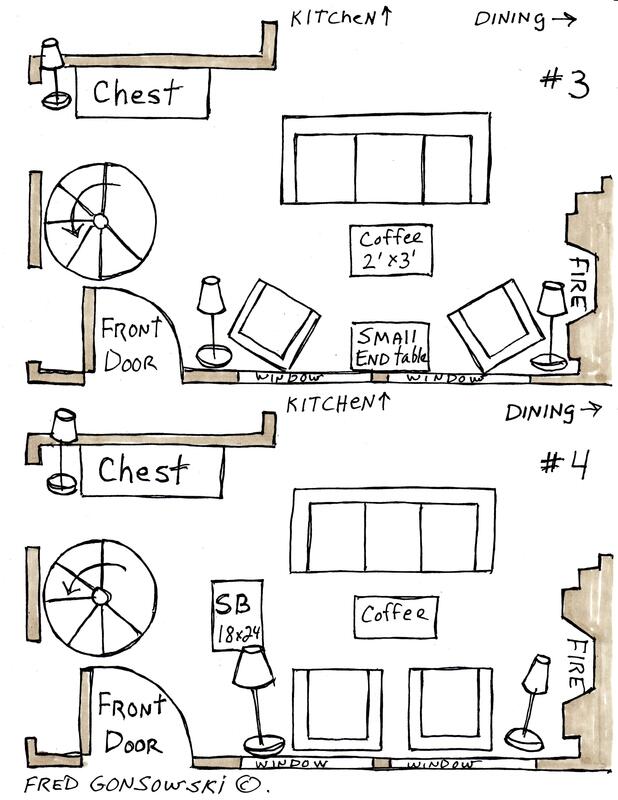 Recently one of the readers of this blog named Joy asked for my help with the arranging of furniture in her living room, which is open to her kitchen and dining area. Joy has downsized from a larger house to a smaller space and arranging furniture in her new, somewhat open concept, home has become a bit of a challenge. Joy’s dilemma became the starting point for this blog post. I’ve come up with eight possible layouts that she might want to try; hopefully one or more will be to Joy’s liking. 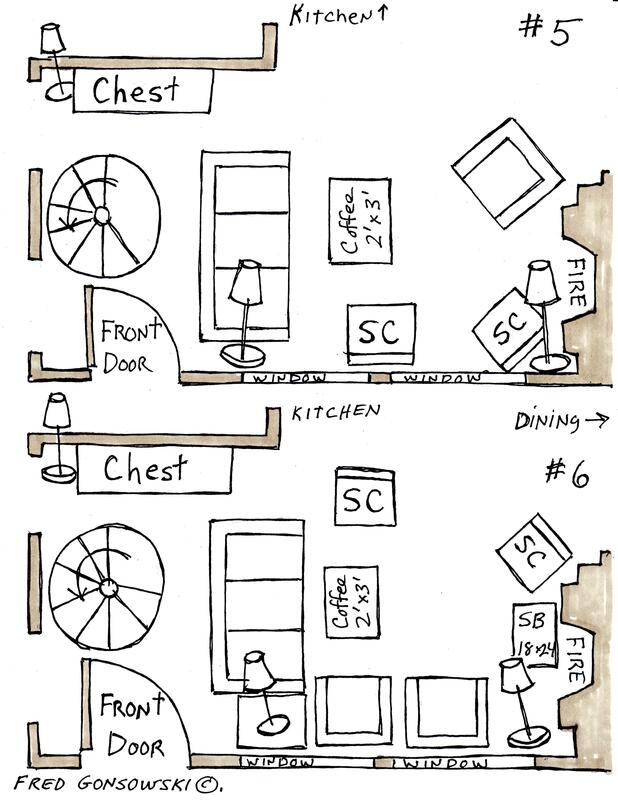 The above illustration is a measured drawing of Joy’s living room, dining area and kitchen that she made for me (click on illustration to enlarge) The part of the space that I’m covering in this blog post is all the area that is outlined in pink, which makes up her living room. 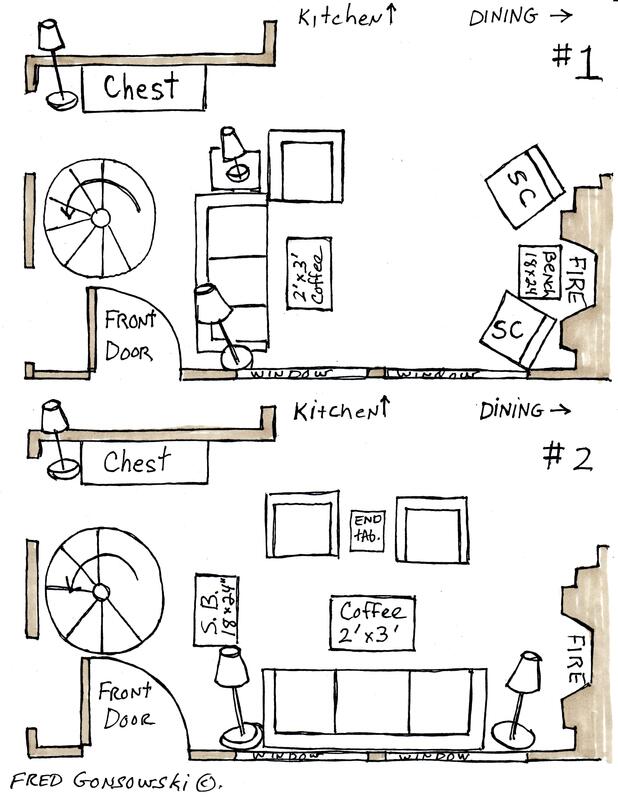 The overall dimensions of the living room space are 13’8″ by 18′ but Joy has installed a spiral staircase that is 43″ wide on the left side of the living room, as seen in the illustration, so that had to be addressed. The first thing that I had to think about was the natural traffic pattern that would lead a person from the front door, through the living room and into the kitchen and dining area. With that traffic pattern in mind, and how much space it took up, the final amount of space for arranging furniture in Joy’s 13’8″x 18′ living room was now reduced to about 11’6″ by 11’6″. So with that in mind, let’s look at the first two illustrations. To come up with the arrangements of furniture for Joy’s space, I first made a graph using many sheets of printer paper that I taped together. I took that paper and marked it off in one inch squares, that represented one square foot of space in Joy’s living room. 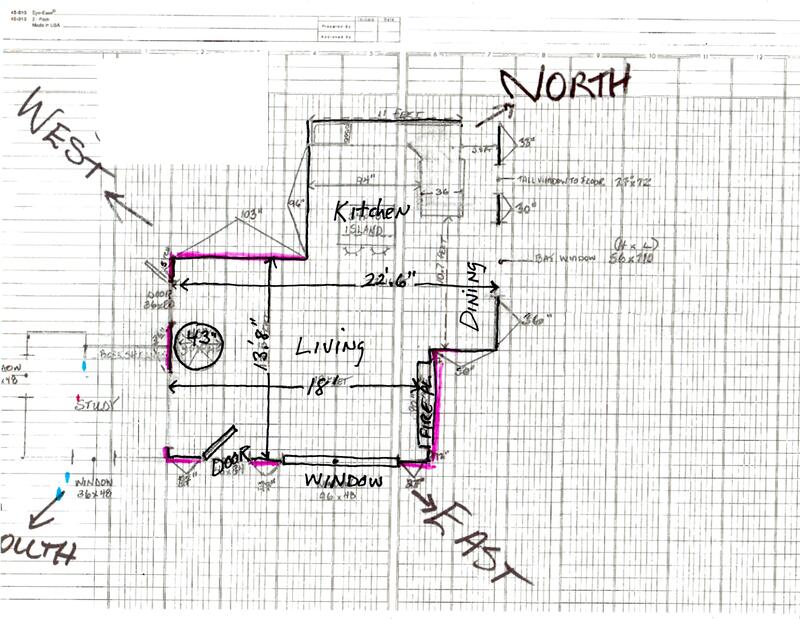 After that, I took the dimensions of the room that she provided, and transferred those numbers to the graph paper to form a larger measured layout of her living room; showing the placement of doors, windows, the fireplace, etc. I next used templates (paper cutouts) of furniture that I had made for other blog posts representing furniture that would be used in the living room. I have a 3 inch by 7 inch templates that represent a 3 foot deep by 7 foot long sofa, a 3 inch by 3 inch templates that represent a 3 foot by 3 foot club or wing chair, a 1 and a half by 2 inch template which represents an 18″ by 24″ small upholstered bench, a 2 inch by 2 inch cutout which represents a 25 inch by 25 inch upholstered side chair (an occasional chair or dining room chair with an upholstered seat and back, preferably without arms and possibly with covered legs) and a 2 inch by 3 inch template that represents a 2 foot by 3 foot coffee table or ottoman. Now lets look at Illustration #1. In this illustration I first want you to look at the chest which is the first thing, past the spiral staircase, that a person would see when entering the front door. The chest in this illustration and all the following illustrations represents the buffet for the dining room table, that is pointed to by the word dining and arrow, seen in the upper right corner of this illustration, and on the drawing provided by Joy. In this illustration, I’ve placed a floor lamp to the left of the chest to illuminate that corner of the room. If a person did not want to use a floor lamp, than an accent lamp or two, or a pair of buffet lamps could be placed on the chest/buffet for illumination. Now look at the positioning of the sofa by the front door. The sofa’s back kind of creates a natural walkway from the front door, past the spiral staircase, and toward the chest in the back of the room. Because of limited floor space to work with, the sofa is flanked on one side by a floor lamp and on the other side there is a small end table with a lamp on it. A club or wing chair is placed next to the sofa to form a conversation grouping. To counter balance the sofa and club chair, on the other side of the room, are two side chairs (SC) and a small upholstered bench that could be moved around the room if needed. The coffee table or even an ottoman is 2’x3′, just large enough to have something in the space to put a glass on or a plate of food while looking at the fireplace. Because of the small size of the seating area, the coffee table could be eliminated in this room setting, and all of the following room settings to provide extra empty floor space. Illustration #2 has the sofa placed by the windows in the front of the room. Two club chairs, placed about three feet from the back wall of the living room (the wall where the chest is placed) counter balance it; there is a small end-table between them. A small upholsterer bench (SB) is placed to the left of the furniture grouping. Two floor lamps, or two small end tables with lamps on them flank the sofa. Illustration #3 has the sofa positioned about 3 feet from the back wall of the living room, and it is counterbalanced by a pair of upholstered club or wing chairs, etc placed opposite it, with a small end-table between them. Two floor lamps are tucked behind the upholstered chairs to illuminate that side of the room. Illustration #4 shows the two upholstered chair now placed next to each other and they are flanked by a pair of floor lamps, or even a pair of small end-tables with lamps on them to illuminate that side of the room. A small upholstered bench (SB) is to the left of the furniture grouping to provide extra seating and it can be moved easily up by the fireplace if needed. Now look at Illustration #5, which has the sofa now back by the front door and there is a floor lamp to its left. Two upholstered side chairs (SC) have been placed by the window with a floor lamp behind the chair closest to the fireplace. A club or wing chair is placed to the left of the hearth to finish off the conversation grouping. The upholstered chair and the side chair by the fireplace, counterbalance the sofa opposite them. If space permits, some kind of coffee table or ottoman could be placed in the seating area. Illustration #6 shows the sofa in the same place as illustration #5, with a small end-table with lamp next to it. A pair of club or wing chairs, or one of each, are now next to each other by the window and there is an upholstered side chair (SC) opposite them. An upholstered side chair and a small upholstered bench (SB) are by the fireplace; a floor lamp was placed in the corner to illuminate that side of the room. 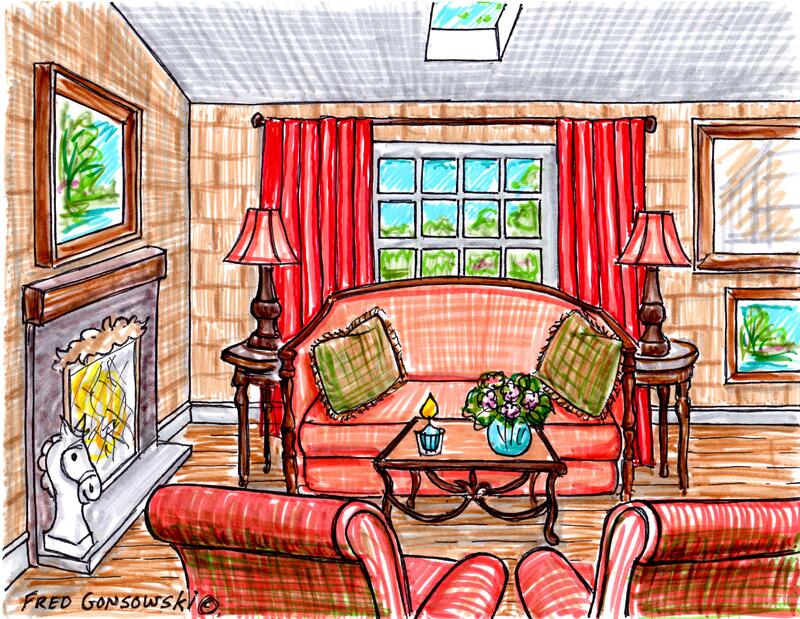 Illustration #7 shows the sofa again by the front windows and an upholstered club or wing chair is to its left. The sofa is flanked on one side by a small end-table with lamp and on the other side there is a floor lamp. Two upholstered side chairs (SC) are opposite the sofa. 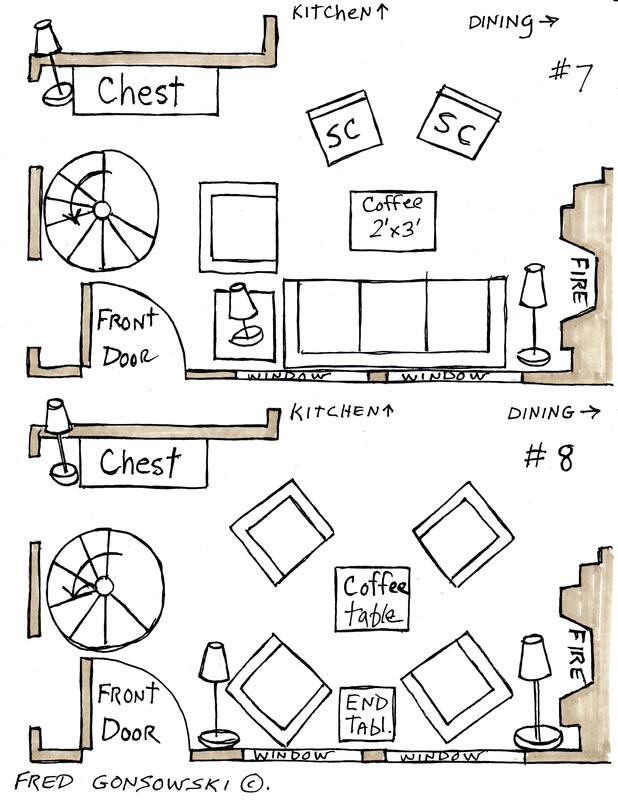 Illustration #8 has the sofa moved to the den, or some other room in the house, and there are just four upholstered club or wing chairs in the space with a coffee table or ottoman in the center of the grouping. Floor lamps are placed in the front corners of the room for illumination and an end-table is between them. People think that when they have open-concept spaces they have more room, but that is not always the truth. Open-concept living means fewer walls to hang things up on, and less wall space to place furniture up against. Open concept is, in a way, a way of tricking people and their eyes into thinking there is more space there than there really is, especially if there are tall ceilings. Open concept living, I think works best for people who have and like minimal possessions and a clean uncluttered look. But, if a person is a collector, open concept living only works if the space is really large so there is room to make multiple furniture groupings and room to display collectables. To look at other articles that I’ve written on arranging furniture and decorating look at the companion posts that follow. Mixing and Matching Fabric and Wallpaper Patterns 4-13-2012. This entry was posted in Arranging Living Room Furniture, Interior Decorating Principles. Bookmark the permalink. Fred, you are the best. Once again I have learnt so much. Your illustrations and words are so VERY helpful. I love how you explained why the sofa and chest of drawers are placed in illustration 1 – one, the sofa, is a visual and physical object that guides people through the space and the other, the chest, is the focal point that catches your eye and encourages you to move beyond the door and sofa to the kitchen and dining beyond. Thank you so so much. Hi there Kim, thanks for your encouraging comment. Once you understand it, and you now do, you will understand traffic patterns created in different spaces. But in the interim, I am going to implement all my Fred directives and see where I land! Hi there Joy glad you are happy with my your post, take the projects in small steps and over time it will be the way you want it. Spring is on its way, which brings on new energy for doing things. How do I get your opinion about a townhouse in Philadelphia with an angled fireplace? Hi there Fran, possibly my post titled Arranging furniture around a Fireplace in the Corner of a Room might help. Floating (Arranging) furniture in a 20 foot long by 20 foot wide living room, could also inspire. Arranging Living Room furniture, so Sofas talk to Chairs, like the Pros do is a fundamental post about grouping furniture. If none of those articles help, get back in touch with me and maybe your dilemma will be an upcoming post. Its about time for you to consider putting all of your posts into a book. From gardening to design you nail it in an easy to understand format and principles. Hi there A.B. I would love doing a book, but so far, even though I’m fifteen thousand views short of hitting the Three Million point for page views/articles read, no one from a real publishing company has come forward and got in touch with me. Not being part of the so-called “club” of taste-makers with connections in New York City, it makes it difficult for a person like me, who writes things and posts them to get noticed. Though, A.B. i do suspect that some people who are famous, in the design and gardening world, have looked at my website, even though they would never admit to it or comment. A.B. thanks for your comment, it is quite appreciated. Hi there Lindsay, You are picked, but I have someone before you to do. The problem right now is that I’m working on my garden, starting the Fall cleanup, and then I have to paint all the trim on my house. After that I will be addressing reader’s problems again. I will send you an email message closer to the time I will be ready to possibly help you.